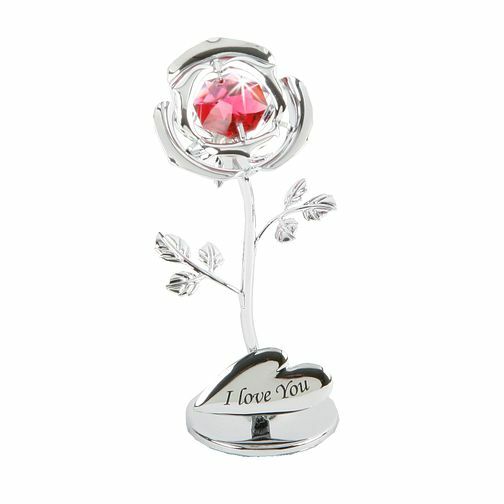 Show them how much you love them with this beautiful Crystocraft celebration rose ornament. A beautiful present for someone special, this ornament is the perfect gift for a variety of occasions. Crystocraft Celebration Rose I Love You is rated 5.0 out of 5 by 3. Rated 5 out of 5 by Anonymous from This is beautiful gift I must say it looks better on eye on eye contact rather then online! Crystal is sparkly, also whole item is well made. Rated 5 out of 5 by Anonymous from Beautiful! A small delicate flower with a stunning crystal rose. I love it and it's such a brilliant price I even bought another! Would definitely recommend.